Donor Motivators and Donor Organisers often look for suitable slogan for their campaign. Here are some slogans collected or coined or used by them. These slogans with suitable visuals can be converted into posters. 1.The blood you donate gives someone another chance at life. One day that someone may be a close relative, a friend, a loved one—or even you. 2.A life may depend on a gesture from you, a bottle of Blood. 3.To give blood you need neither extra strength nor extra food,and you will save a life. 4.Do you feel you don’t have much to offer? You have the most precious resource of all: the ability to save a life by donating blood! Help share this invaluable gift with someone in need. 5.Blood Donation will cost you nothing but it will save a life! 6.If you’re a blood donor, you’re a hero to someone, somewhere, who received your gracious gift of life. 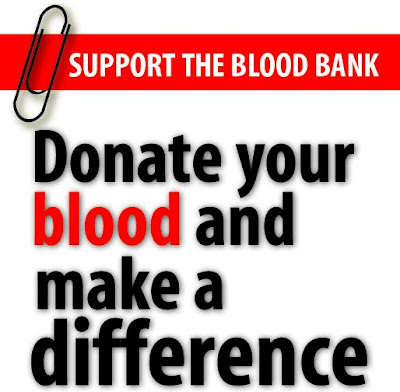 7.The finest gesture one can make is to save life by donating Blood. 8.Tears of a mother cannot save her Child. But your Blood can. 9.The Blood Donor of today may be recipient of tomorrow. 10.To the young and healthy it’s no loss. To sick it’s hope of life. Donate Blood to give back life. The blood is red gold in time of saving a life. Share a little, care a little – Donate Blood. Five minutes of your time + 350 ml. of your blood = One life saved. Blood is meant to circulate. Pass it around. Donation of Blood means a few minutes to you but a lifetime for somebody else.